Traders worked on the floor of the New York Stock Exchange. Investors bet big on US stocks Wednesday, giving the market its biggest single-day gain in nearly four months and pushing the major indexes to record highs. The Dow Jones industrial average rose above 21,000 points for the first time in what was the biggest gain for the blue-chip index so far this year. 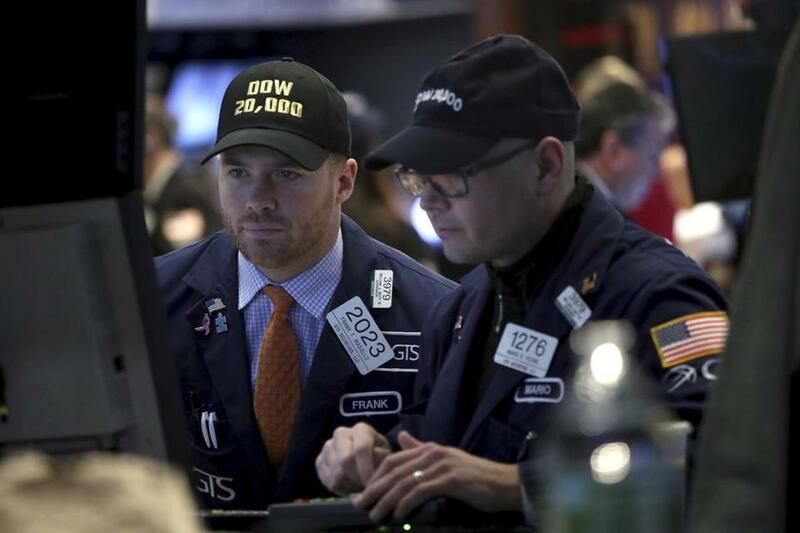 Wednesday’s sprint past 21,000 matched the previous record for 1,000-point gains, set in 1999 when the Dow ran from 10,000 to 11,000 in 24 trading sessions. Banks were the biggest gainers amid heightened expectations that an improving economy will lead to higher interest rates. Energy stocks also notched big gains. Utilities and real estate stocks lagged. The dollar strengthened against the yen and euro and other major currencies. Bond prices fell, as did the price of crude oil and gold. Optimism over corporate tax cuts, deregulation, and other business-friendly policy proposals reiterated by President Trump during a speech before Congress helped fuel the rally. Growing speculation that the Federal Reserve may soon elect to raise interest rates again also helped put traders in a buying mood. The Dow jumped 303.31 points, or 1.5 percent, to 21,115.55. At one point, the 30-company average was up more than 356 points. The Dow hadn’t been up more than 300 points in one day since November. The Standard & Poor’s 500 index gained 32.32 points, or 1.4 percent, to 2,395.96. That’s the biggest single-day gain for the index, the benchmark favored by professional investors, since early November. The Nasdaq composite index added 78.59 points, or 1.4 percent, to 5,904.03. Small-company stocks continued to outpace the rest of the market, a bullish signal on the economy. The Russell 2000 index rose 26.95 points, or 1.9 percent, to 1,413.64. All four indexes closed at new all-time highs. Each had set new highs last month. Bond prices fell and yields rose after a key Federal Reserve official, New York Fed President William Dudley, said the case for raising interest rates had gotten stronger. The 10-year Treasury yield rose to 2.46 percent from 2.40 percent late Tuesday. Strong gains in major global stock indexes overnight and into early Wednesday hinted at the possibility of another milestone day for Wall Street. Better-than-expected company earnings and outlooks from Lowe’s, Big 5 Sporting Goods, and other companies also helped give the market a boost. But it is the prospect of more profitable days ahead for Corporate America that encouraged investors to pile into stocks. On Tuesday night, Trump struck a less confrontational tone than usual and steered away from dramatically negative descriptions of the state of the US economy. Trump also reaffirmed his pledges to reform taxes, slash red tape, and ramp up spending on defense and infrastructure projects, though his remarks offered few new policy specifics. The proposed reforms have helped send US stock benchmarks to record highs in the weeks since the election in November. ‘‘The market has shifted from being worried about lower growth for longer, to expecting more growth sooner rather than later,’’ said Chris Zaccarelli, chief investment officer for Cornerstone Financial Partners. Financials led all other sectors in the S&P 500, climbing 2.8 percent. The sector is up 8.1 percent this year. JPMorgan Chase climbed $2.98, or 3.3 percent, to $93.60. Goldman Sachs rose $4.65, or 1.9 percent, to $252.71. Markets overseas posted solid gains. In Europe, Germany’s DAX rose 2 percent, while France’s CAC 40 gained 2.1 percent. Britain’s FTSE 100 picked up 1.6 percent. Earlier in Asia, Japan’s benchmark Nikkei 225 gained 1.4 percent and Hong Kong’s Hang Seng added 0.2 percent.